So, how **EXACTLY** does VM HA's admittance algorithm work? or, like this if you're trying to power on a machine and DO have the "don't start" option ticked. A big thank you to Jack Lamirande (VMware) and Brian Whitman (EMC, VMware Specialist) for helping me head scratch through this once. So - what is happening here, and why is it hitting you (perhaps) for the first time? Virtual center is planning for the worst case to cover you. There are three core things to understand. Step 1 - Determining Max Slot Size: Ok - what is a "slot"? It means "worst cast CPU/Memory". This is discussed in the VMware Resource Management Guide (it's funny, people read the HCL like it's holy gospel - and it kinda is - and sometimes good docs fall by the wayside) here: http://www.vmware.com/pdf/vi3_35/esx_3/r35/vi3_35_25_resource_mgmt.pdf. Check out page 75. Maximum Reserved MHz and Maximum Reserved are the DRS reservations you put in for VMs. VC 2.5 would calculate a Slot Size of 8GHz of CPU, 2GB of RAM. Whoa! what happened was that since VC 2.5 starts to think about vCPUs - it multiplies the max number of vCPUs on VM1 (which was 4) times the Maximum MHz of VM2. VC 2.5 will also add a fair amount of RAM vs. VC 2.0.x - 256MB per guest. Step 2 - Calculating Host Available Slots: VC then calculates the number of slots available on each ESX server based on this "Maximum Slot Size", basically dividing the ESX servers memory by the maximum slot size memory requirement, and the ESX server's CPU (CPU in MHz * number of CPUs = total MHz). Each cluster node is assigned a "number of slots" it can support. So, using the examples we've been using, you have a total of 14 slots with VC 2.0.x and 3 slots with VC 2.5 - for the same configuration. You can see immediately why some people hit a problem when they upgrade. Virtual Center 2.5 is more conservative. This is an outcome that happens when you support more and more mission-critical customer use cases (and if you're wondering why EMC is so adamant about our e-lab and interop checks, it's the same root behavior). There are a couple of workarounds if you are willing to play a little more loose. avoid using large reservations and multiple vCPUs. The moral of the story is be smart, and know how the IT tools you use work. VMware changed the formula, for a simple reason - to make the environment more available when you really need that. Note how some of these best practices (not formalized enough to call them Best Practices with capital letters, I'll call these "cbp"'s or Chad's best practices :-) will dramatically make this better. The general rule is to avoid over-engineering. Over-engineering forces the VM HA algorithm into bad corners. Use DRS reservations and limits when you really need it, and are willing to invest the time to understand it. Notice that reservations will generally be materially larger than the Maximum Memory Overhead. 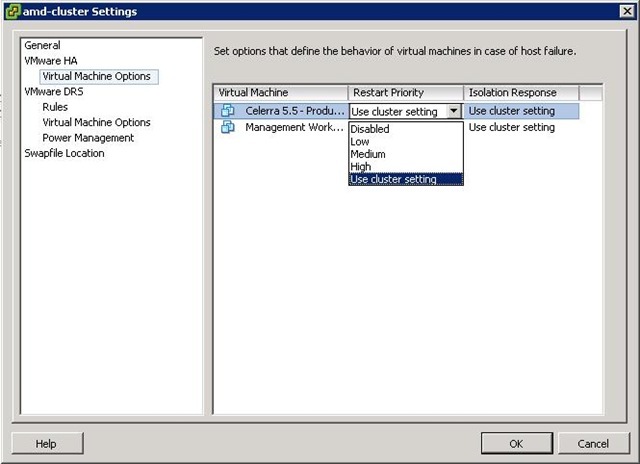 Don't be afraid to have a DRS enabled cluster where the majority of machines have the default (no reservation, no limit), but likewise, don't be afraid to make reservations on the VMs that are really important. VMware is very efficient with large cluster sizes. I'm always surprised to see people with two 6-node clusters right beside one another. When you ask "why not one 12-node cluster", it's usually "it made us uncomfortable". This is usually rooted in experience in the increasing complexity of MSCS (now WSFC) or Oracle RAC. VMware ESX Clusters and VM HA are architecturally different. VMware's cluster is really a loosely coupled set of servers, shared storage only, with VC acting as orchestrator. This means cluster scaling and complexity are the same with lots of nodes. What does get better is that the VM HA algorithm has more choices. NOTE: there are some good reasons to have a couple smaller clusters: a) you keep "like" VMs on the same cluster - note that the Maximum Slot size is the BIGGEST VM - so if you keep small VMs on one cluster, and big VMs on another, the algorithm is more efficient. ; b) your end users demand it (sometimes this is the case in multi-tenancy "clouds"). What are your experiences and thoughts on this topic? Your SRM post is a good one - http://www.vinternals.com/2008/05/what-vmware-site-recovery-manager-isnt.html. 1) Replication Manager 5.1.2 (trying to get them to rename it to "Replication Manager for VMware" - this handles application-integrated backup, VMFS-level integration, and array snapshot mechanisms. 2) Avamar Virtual Edition (and regular) - source based dedupe, very cool, very popular with VMware. For Networker customers - Avamar can be integrated also. Gabrie - thank you! You can absolutely link of course!.... Still trying to figure out how this trackback thing works. It's always fun to learn new things! 1.- Sometimes people prefer not to exceed the 8 ESX node cluster because VMFS has a bad performance over this number of nodes (8) accessing the same VMFS formated LUNs. It's a storage/performance Best Practice. VC2.0 -> The smaller of [(8 slotmem + 12 slotmem) OR (6 slot CPU + 8 slot CPU)] = 14 Virtual Machines Max? VC2.5 -> The smaller of [(8 slotmem + 8 slotmem) OR (1 slot CPU + 2 slot CPU)] = 3 Virtual Machines Max? 3.- My personal recommendation is that it's better to use Shares in a DRS cluster (because of its dynamic behaviour) instead of using Reservations. Thanks Jon - wish I could read spanish, you would have saved me a lot of time! 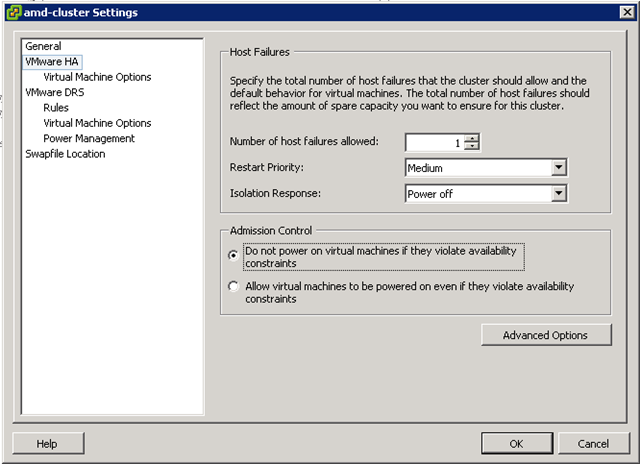 1) I haven't seen that VMFS issue (bad VMFS performance with more than 8 hosts) - do you mind providing the source? It's certainly not an EMC storage best practice - I want to make sure it's not an old thing. Most VMFS "limits" are mythology - not saying this is or it isn't but would like to make sure. 2) You got it right. 3) Interesting idea - you can certainly use shares (which are relative to one another and don't work into the math) - my preference is use shares, but then there are some VMs where you absolutely need reservations - use them. It's not the reservations that really hammer the map, it's the vCPU multiplier. I personally think that it VARIES from one environment to another, sometimes we have very heavy VMs and other times not. I think that the DRS infrastructure is like building a wall with irregular bricks. In most cases a 12 host cluster is appropiate because there are no(or a few) CPU/Mem killer VMs. In other cases a 6 cluster + 6 cluster is better in terms of storage and in terms of DRS maximization. 3.- Completely agree. Only use Reservation if you REALLY need them. And if th VM needs high reserves, think if it has to be virtual or not, or if it is worth to put in another esx or not. A very useful post! I want to ask a quick question regarding the math involved in the calculation. We calculate the host memory slots based on the host memory divided by memory slot size. So in the examples below it should be 32/2 = 16 slots. Is this correct or did I missed something in the article? Great post very informative, I wouldnt mind seeing how you manage to get 54 Outlook items open!!!! Jon - you're correct, and I mistyped that. thanks for the correction! Great post! Thanks a million! For everyone that has difficulties calculating this for their own specific environment, I have created a script that can do the hard work for you. What if you have say 4 VMs (each with 1 vCPU each) in a resource pool with 8000 MHz assigned to the resource pool... how does that affect the HA math? Lets say the largest VM is 4CPU and 16GB RAM (with a 16GB reservation). The ESX servers are all 2 socket, quad core 3GHz with 32GB RAM. With overhead (about 650), my RAM slot size would end up being around 17GB., which gives me less than two slots per ESX server. Is this correct? Now, if I have a VM with only 1 CPU and 2GB RAM, it will still take up a slot. If I do not change the default slot size settings, the slot is roughly 75% wasted. Is this correct? In this scenario, if I do not “tweak” the slot sizes, do I only get one VM per node since it works out to about 1.7 slots per node? and like we discussed your assumptions are correct. 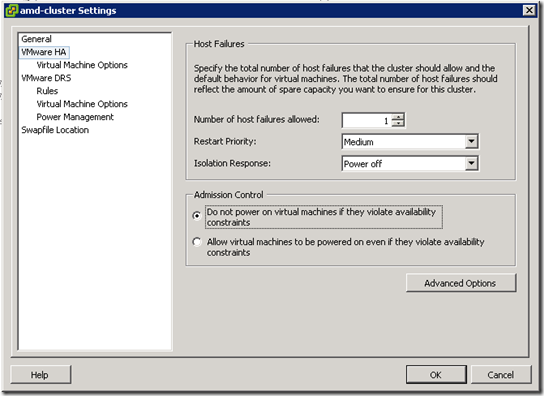 Please let me know how and when HA will recalculate Slot's after addition of VM's to HA cluster. Great post .. and the comment "satisfying the reservation takes more than the end-user expects" made me laugh. Because we had this error and it took me quite a bit of research and talking with vmware help to get us going. (And by the way while I like vmware support, they are very talented, I think I got someone who wasn't too good - just kept blowing us off so I had to go through the manual). We were barely using 20% CPU and 30% RAM and couldn't power on another VM with a host failure cluster tolerates set to 1 (of 5 servers). When I changed to percentage, I was able to take it to 75% reservation and still power on VMs. (WHAT?). We fixed a lot of our VM reservation issues so we are good now, but I couldn't even imagine why the failure cluster tolerates wasn't working. So anyway, long story short (short story long?) this post about calculating the slot size, and how conservative that calculation is, was quite enlightening!! Thanks! !